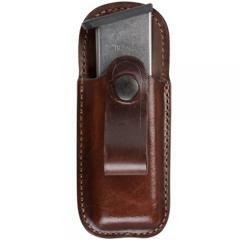 Carry extra ammunition on the down low using the 21 Inside the Pant Single Magazine Pouch from Bianchi. Built to discreetly provide users with additional magazines, the carrier utilizes an inside the waistband (IWB) design for maximum concealability. Dual belt loop straps secure the pouch to the belt, providing superior stability that prevents the holster from sliding around when running, walking or jumping. The pouch has an open-top for easy magazine gripping and speedier item retrieval. The entire case is constructed from premium quality leather and is impervious to moisture. This means that the holster will not warp or deteriorate when exposed to sweat and the elements. TakeDown OC-5.5 MK-IX Fogger Spray 18.34 oz.